I have a bevy of downloadable games on my Xbox, yet I don’t believe I’ve ever written up on any of them. Since I’ve recently fallen in love with this title, why not start here! 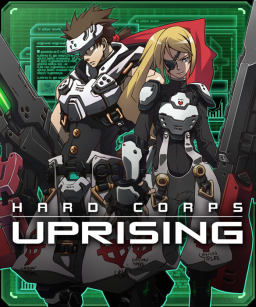 Hard Corps: Uprising! And not only is it a side scrolling shooter, but it’s another entry into the esteemed Contra series. HC:U is a prequel to the game Contra: Hard Corps released way back in 1994 for the Sega Genesis. The story isn’t one that’s too involved. You play as Bahamut or Crystal, two rebel soldiers hellbent on taking down the tyrannical Tiberius, the leader of an evil empire called The Commonwealth. You will traverse across different lands, taking down his subordinates, gaining freedom for the Resistance. If you’ve played Contra, then you’ve pretty much played this game. It doesn’t necessarily seek to reinvent the wheel so much as polish it. The staple weapons are there: heavy machine guns, spreader rifles and rocket launchers. They also merged together previous weapons; the laser gun is now a combined version of the previous laser gun mixed with the homing missiles gun. So you have a homing laser gun, which is by far, my favourite. In addition to your arsenal of weapons, the characters are also equipped with special moves now. You can double jump (or triple! ), dash, mid-air dash, tackle, reflect bullets, etc. These two elements combined gives you some versatile characters. The game offers two main modes: Arcade and Rising. Rising is where you’ll have the most fun. All the points that you collect as you play through the game act as currency and are banked. Between levels or outside of the gameplay, you can go to a shop where you can purchase weapon upgrades, extra lives, increased health bars and other bonuses. Rising mode also affords you the opportunity to select your starting point from any level that you previously completed. With the ability to start with 30 lives in a playthrough, Rising mode allows you to practice and hone down your skill for the real test, Arcade mode. In Arcade mode, all the goodies and treats you garnered in Rising mode are gone. The training wheels get taken off. You start bare bones, save for a few abilities. 3 lives and a few continues are all you get to start and finish the game. It’s not easy and takes practice. Speaking of the difficulty, it is do-able! Nothing is so terribly hard that you will eat yourself for failing. A lot of times it just takes a bit of patience to observe the enemies patterns and different attack modes. Gone are the bullet hells - those intense moments in previous games where it seemed like every inch of the screen was filled with a bullet, and you were somehow supposed to dodge them all. Yes, it’s simpler in that sense. The game looks stunning in HD, incorporating an anime style for its characters atop of futuristic, hyperstylized backgrounds. The music is catchy and upbeat too, apropos for the game style. I had fun and am still having a lot of fun with HC:U. It’s only 1200 MS points and if you’re a fan of side scrolling shooters of yore, you can’t go wrong here! Til next time, later geeks!